Carcassonne exists since prehistory. Pline the Old writes about "Carcasso" in the first century before Christo but it seems that the term already existed since several centuries. To the end of the IIth century bC, the place is an oppidum with channels and Gaulish houses. In 118 bC, Roman occupied the place, they reinforce the oppidum. Later the Visigoths occupied the oppidum in the Vth a-C, therefore the Arabians invested the place in the VIIIth century, they remained there approximately 30 years before being hunted by Franks. This last ones gave the name of "Karkashuna". After the separation of the Carolingian empire of Charlemagne, the feudal age is established with at the head of the city the Trencavel family that has reigned until the XIIth century. Carcassonne prospers and takes a strategic place very important in Languedoc (Languedoc = Langue d'Oc with means Language of Occitania). The Catharism was very developed in Carcassonne. Cathars ones were protected by the vicomte Raimond-Roger Trencavel, the city becomes a land of heresy for the Pope. Cathars were catholics with a lecture different of Bible and they rejected the luxury of Catholic church. For example, they believed in the duality of God : God make goodness and badness. In a way, God and Devil is the same entity. Consequently, it will endure the fires of the crusade directed by Simon de Montfort. 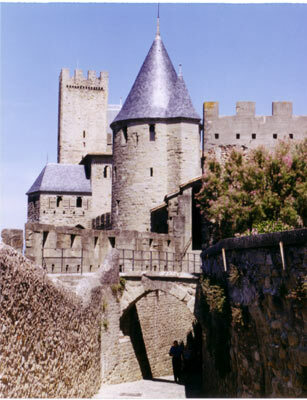 Therefore in the month of August 1209, the army surround the centre of Carcassonne. The Vicomte of Carcassonne has to capitulate. Immediately he was thrown in jails where he died quickly. A new Vicomte was chosen between the Barons of the north, he was Simon of Montfort himself. 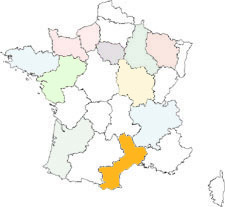 The city integrated the French Kingdom in 1224. This last event is important in the history of Carcassonne. Saint-Louis authorized the creation of a new city: a fortification is created under the city of Carcassonne on the other side of the river. In the XIVth century, the city is the first center of production of weaves in the kingdom. This wealth allows to improve the city. Unfortunately, numerous problems caused the loss of this mono-industry. Under the restoration, the activity is mechanized and the salaries are drawn towards the bottom. The wine culture entered in competition and the misery earns the city of Carcassonne. In 1348, the city is touched by the plague like the rest of the country and the epidemic is recurrent until the following century. At this same time, the war of one hundred years caused many damages. The Black Prince put fire to the down tow in 1355.